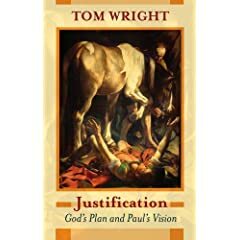 This book is a response to many of Wright's North American critics and to John Piper's The Future of Justification in particular. It is not a point for point reply to Piper but a general articulation of what Wright really thinks about justification with some hand-to-hand combat with Piper (as well as others such as Carson and Seifrid) along the way. Wright gives a very forthright defence of his position, but is certainly not acrimonious or uncharitable towards Piper. I'll try to post a review of the book once I get my hands on it. The UK edition comes out in February, but we'll have to wait until July for the American release. So, if you live in the UK, let me know! Looks good, I'll pick it up as my travel read for the next time I'm stuck on a plane. Given that you've read the proofs, I'm interested in hearing what you think it should be worth to me?! Of course, you can simply order it from the Amazon UK web site. Very true Chris, I suppose my wish is for an advanced copy. If that doesn't happen, I'll probably go the Amazon UK route.